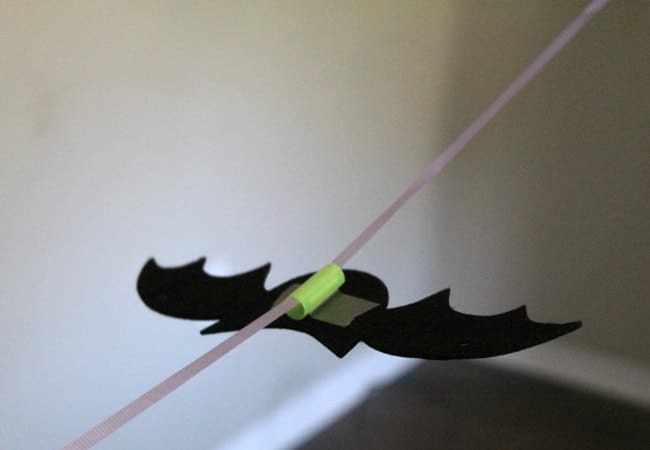 This flying bats STEM activity will be a hit with your preschooler as they send their bat flying around the room. This activity will have them designing their own bat and a system engineered to make it fly this Halloween. Are you up for the bat STEM activity challenge? Learning about nocturnal animals is a fun way to explore night with kids. At this age they are still pretty scared of the night and I think it’s important for them to see all the animals that need the night to survive. We’ve shared quite a few owl activities at The Educators’ Spin On It so I thought it would be fun to share about Bats too. We’ve shared how to make a yummy DIY Bat Graham Cracker which would be the perfect snack for this week’s Bat Theme at the Virtual Book Club for Kids. 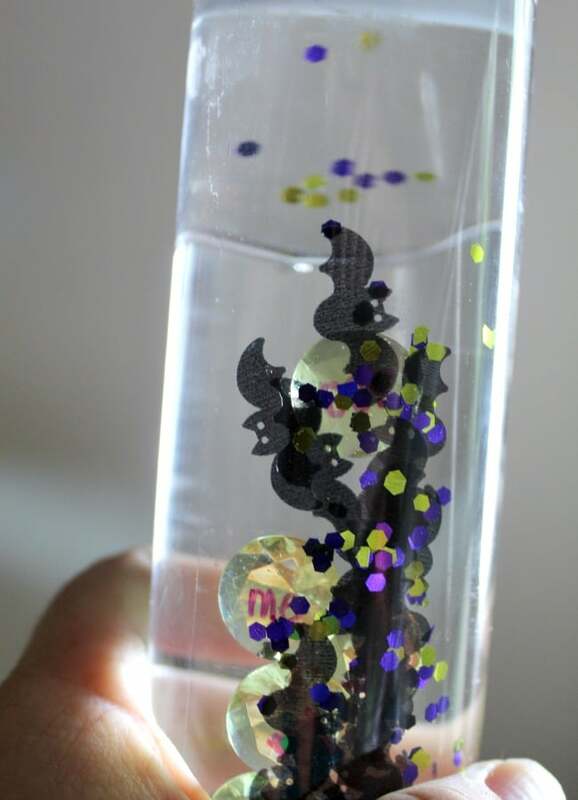 Plus our Bat Themed Sensory Bottle for learning letters and sight words for some hands on fun. 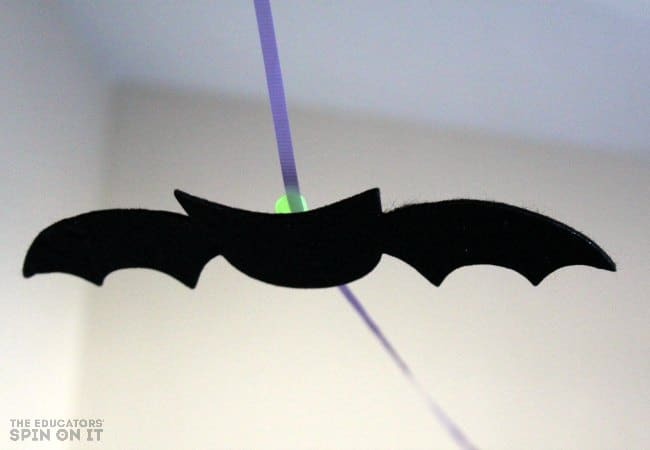 This activity focuses on making your own bat and then seeing how you can design a way to make it fly in the night. by Janell Cannon. In the popular children’s book the fruit bat Stellaluna and her mother are attacked by a vicious owl while out searching for food one night . Stellaluna is separated from her Mother Bat and taken in by a family of birds where she must put aside her bat habits to fit in with her new family. But one fateful flight when she is separated from her adoptive siblings, Stellaluna is reunited with her bat family and learns that even though we’re different, we’re very much the same. It’s an adorable book that focuses on many topics. One fun part that you can focus on is flying! 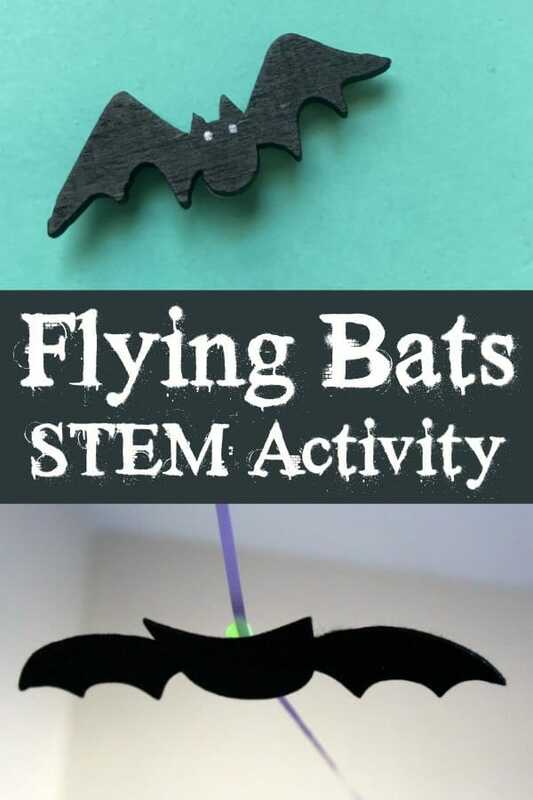 This flying bats STEM Activity will keep your little one busy as they design their master design. Let’s create our Flying Bats STEM Activity as we discuss the story Stellaluna and the things she encountered in the story. Here’s what you’ll need to get started. 1. 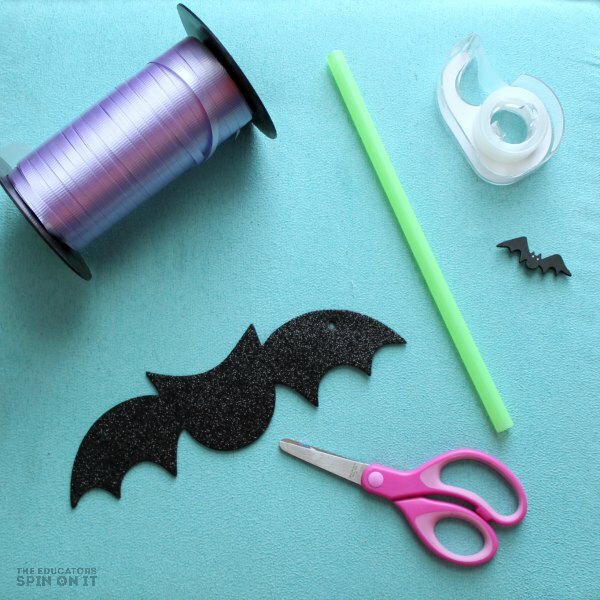 Create a bat with Black Glitter Felt or black cardstock. We used stiffened glitter felt to create ours. 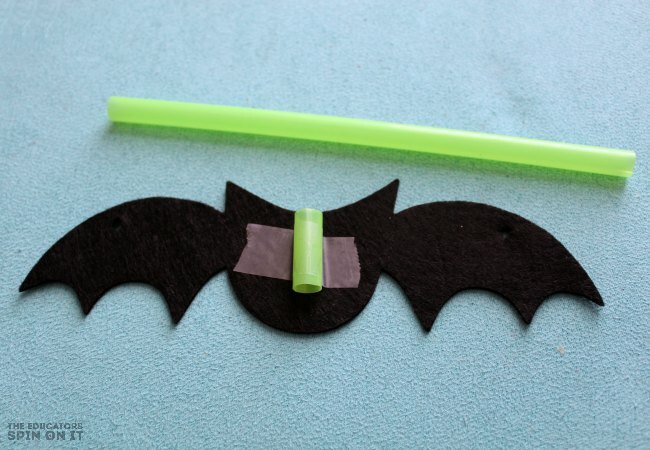 You could use this bat outline if you want a little more structure to cut with your preschooler. 2. Then encourage your child to find a way to make it flying by providing them with the materials of a Straw, Tape, Scissors, and Ribbon. See how they problem solve to encourage their bat to take flight. I prompted my little ones a bit by asking how the straw might help by attaching a smaller piece. 3. To make the bat fly we attached Ribbon onto a bookcase and then lifted the ribbon higher and lower to see what would happen. What happens to your bat when you do this? 4. Take the BAT Challenge one step further…. As the STEM Challenge continued we added various alternatives to see if we could make the bat fly faster. Discuss with your child the changes and why the work or why the didn’t work. 5. Create your own Stellaluna story in your Bat Book by writing a story about your own bats first flight and what it may have seen. Expand your child’s language skills and writing skills as they illustrate this bat book! Here’s a few of my favorite Bat Themed Books for Preschoolers for you to include when you focus on your Bat Themed for the week! Have you ever visited at Bat House? Take a look at our local bat houses that are home to over 400,000 bats. Unlike the fruit bats in Stellaluna they eat insects here in Florida. Can you believe they consume 2.5 billion insects a night. What a great science chat to have with your child. 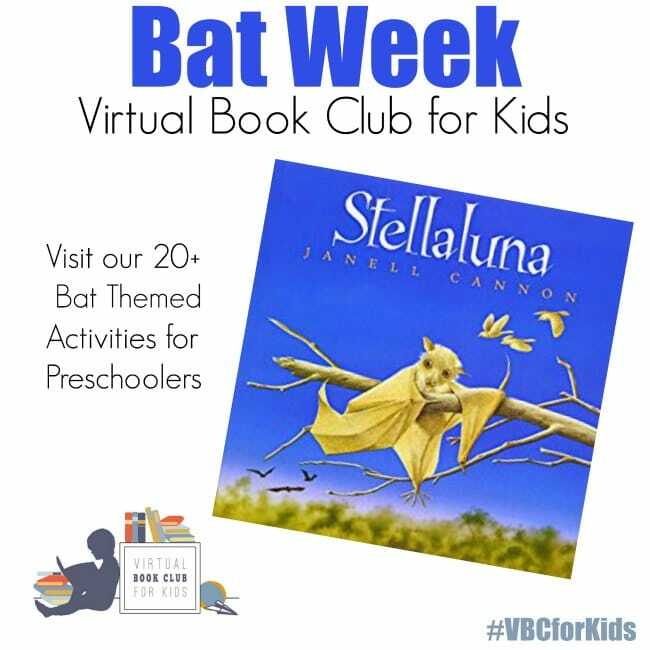 You can find more Nighttime Preschool Activities on out site plus we encourage you to check out these Bat Themed Activities below by our CoHosts at the Virtual Book Club for Kids! Join us next week with our a new Book Club theme of Bedtime! Did you miss last week about Witches ?